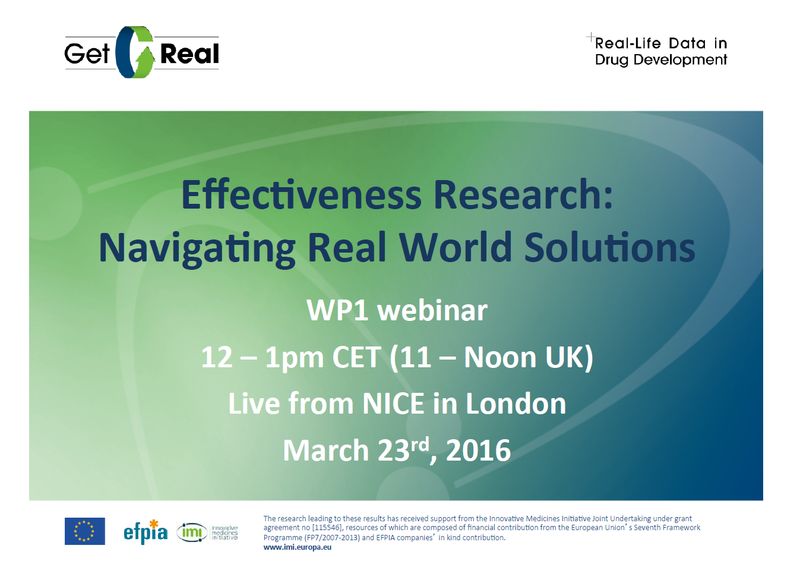 This webinar “Effectiveness research: navigating real world solutions” provides the opportunity for participants to receive the latest updates on key outputs from the IMI GetReal project. Part of the IMI GetReal project has focused on exploring how best to tackle effectiveness research before marketing authorisation. Towards this end, the project has gathered valuable insight from stakeholders and decision-makers on the value of real-world evidence and the acceptability of approaches to gather that evidence to support marketing authorisation and subsequent HTA assessment. In addition to providing an update on progress with the GetReal project, the webinar introduces the framework that is being developed for use by all parties to help plan for assessing relative effectiveness of new therapies.